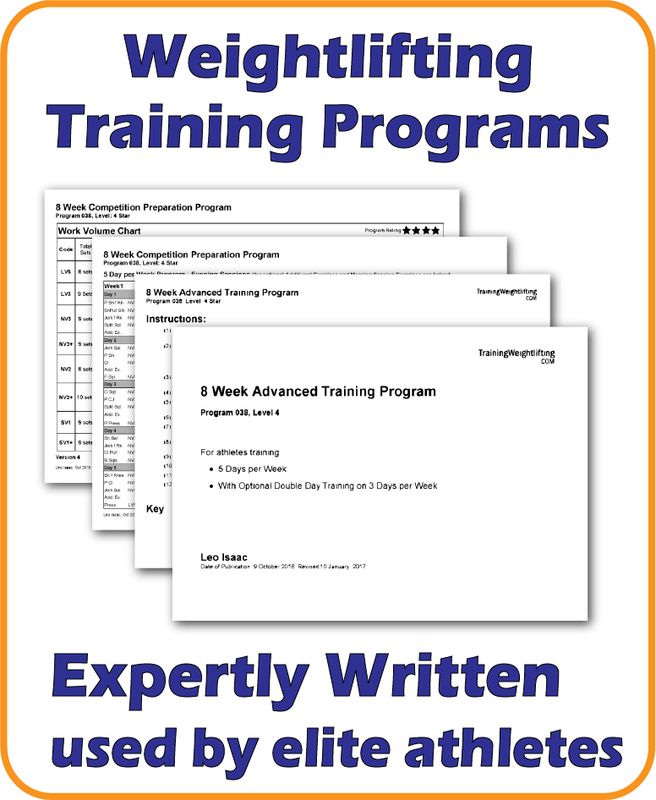 Reliable, well-written and professionally produced Olympic Weightlifting programs are now available on this website. Training programs available cover experience levels from novice to advanced athletes. More programs are being added weekly to cover the needs of athletes preparing for competitions in as short as 4 weeks and as long as 15 weeks. Longer duration programs are phased, for example – Preparatory Phase, Competition Phase. The author (Leo Isaac) is well acquainted with training theory in Olympic Weightlifting having been a devotee of the sport for 42 years as an athlete, coach, director of coaching and lead coach educator in Australia. A special feature of programming method used by Leo Isaac is “Volume Guide” which assist the program user with advice on the amount of warm-up sets, sets at the designated intensity and sets above the designated intensity at periodic intervals. A key issue with written training programs in general is that they need to be individualized according to individual strengths and weaknesses. The advanced programs provided on this site provide a mechanism to add additional exercises for identified weaknesses and to incorporate morning training as well. You will not find a better deal for Olympic Weightlifting programs anywhere on the Internet in terms of the number and variety of training programs that you can buy for very small dollars.